In the fourth volume of the Coraggio! 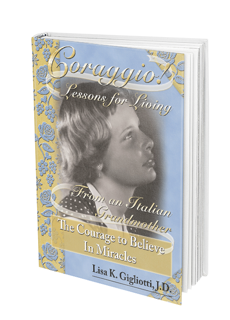 series the author reveals the final lessons learned from her beloved Italian grandmother. The Old World wisdom of the first five lessons begun in Coraggio! Despite Illness, Pain and Loss, soothes the author’s staggering grief over the sudden loss of her mother and maternal grandmother. 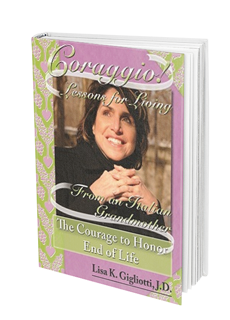 When her Italian grandmother reaches the terminal stage of disease, they link arms, and equipped with coraggio, march bravely into the last season of her life. A beautiful love story between a grandmother and granddaughter ensues, with grandmother illuminating the most significant lesson of all: to surround one with love and tender care as they prepare to leave this world is life’s greatest privilege. Put one of four Coraggio! books in the hand of someone who needs encouragement. Would you join me in offering a prayer that the Coraggio! mission will be accomplished? Would you consider bestowing Coraggio! to a person in need of enCOURAGEment? You may send Coraggio! to a loved one and I will include a gift note with your name or indicate it is a gift from an unnamed person who cares. You may donate a copy of Coraggio! to a person who has requested a free copy because they are unable to pay for a copy.